Prominent examples include the sites of Brú na Bóinne and Carrowmore in Ireland, Maes Howe in Orkney, and Gavrinis in France. The island is famous because of its important passage grave, a megalithic monument from the Neolithic period, belonging to the same broad context as the Breton megaliths of Carnac and Locmariaquer, and closely connected with the monuments at Brú na Boínne (Ireland) and Maes Howe (Orkney). At the time of its construction, c. 3500 BC, the island was still connected with the mainland. The rich internal decorations make Gavrinis one of the major treasuries of European megalithic art. The tomb is also remarkable for the care taken in its construction and its good preservation. The first excavations took place in 1835, when the internal chamber was discovered. Further research was undertaken by the archaeologist Zacharie Le Rouzic who began restoration work around 1930. Further works took place in the 1960s and 1970s. Charles-Tanguy Leroux, former Director of Breton Antiquities, undertook studies and consolidation works in the 1980s. Further excavation is in the planning stages. The tomb was built relatively late within the French megalithic sequence. Its use ceased around 3000 BC. At that time, the light wooden structures cladding its entrance were burnt, after which part of the mound collapsed, obscuring and blocking the passage. A layer of windblown sand transformed the monument into a simple hillock. The most famous of all Irish prehistoric monuments, Newgrange is one of the finest European passage-tombs. Built atop a small hillock, this site was discovered accidentally by the removal of material for road-metalling in 1699. The great tombs of Knowth and Dowth are nearby, and in the same 7.8sq km (3sq mi) area of the Boyne valley are grouped more than 30 prehistoric monuments : standing stones, barrows, and enclosures. Newgrange was originally built about 3100 BC and today is in a much restored form. It consists of a vast stone and turf mound about 85m (280ft) in diameter and 13,5m (44ft) high, containing a passage leading to a burial chamber. Outside the base, 12 out of the original estimated 38 large boulders up to 2.4m (8ft) high form a ring of about 104m (340ft) in diameter. The stone circle was built about 1000 years later than the original structure, dating probably from the Beaker period. This ring of stones is almost unique in Great Britain and Ireland, with Clava and maybe Loanhead of Daviot being the other notable examples. Above the entrance passage is a 'roof-box', which precisely aligns with the rising sun at the winter solstice of 21 December, so that the rays touch the ground at the very centre of the tomb for about 20 minutes. Many of the upright stones along the walls of the 19m (62ft) passage, which follows the rise of the hill, are richly decorated. The cruciform chamber inside the mound measures 6.5 x 6.2m (21ft 6in x 17ft), has three recesses, and is topped by a magnificent corbelled roof reaching to a height of 6m (20ft) above the floor. In the recesses are three massive stone basins which presumably had some ritual use. Excavations in the central chamber produced the remains of two burials and at least three cremated bodies as well as seven marbles, four pendants, two beads, a flint flake, a bone chisel, and fragments of several bone pins and points. He proposed that the Fir Bolg were linked to the historical Belgae, the Fir Domnann were the historical Dumnonii and the Fir Gáilióin were the Laigin. At the summit of the hill, to the north of the ridge, is an oval Iron Agehilltop enclosure, measuring 318 metres (1,043 ft) north-south by 264 metres (866 ft) east-west and enclosed by an internal ditch and external bank, known as Ráith na Ríogh (the Fort of the Kings, also known as the Royal Enclosure). 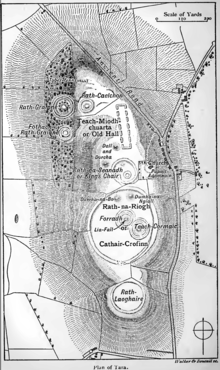 The most prominent earthworks within are the two linked enclosures, a bivallate ring fort and a bivallete ring barrow known as Teach Chormaic (Cormac's House) and the Forradh or Royal Seat. In the middle of the Forradh is astanding stone, which is believed to be the Lia Fáil (Stone of Destiny) at which the High Kings were crowned. According to legend, the stone would scream if a series of challenges were met by the would-be king. At his touch the stone would let out a screech that could be heard all over Ireland. To the north of the ring-forts is a small Neolithic passage tomb known asDumha na nGiall (the Mound of the Hostages), which was constructed around 3,400 (cal.) BC.